2. Remove sprayer from side holster. Unwrap the tubing. Gently pull tubing out. 4. Securely snap the hose plug into opening in cap until it snaps into place. 6. Remove plastic tab near bottom of sprayer to activate batteries. 7. Twist nozzle to adjust spray from CLOSE to SPRAY or STREAM . 8. When priming the sprayer, hold sprayer level to the ground. Squeeze and hold trigger until liquid comes out the nozzle. Sprayer may not prime if it is held at an angle. Once primed, it will spray in any direction. Aim toward target area to be treated and away from people and pets. To improve accuracy, use slider to extend wand. After use: 1. Twist spayer nozzle completely to CLOSE position. 2. Turn hose plug switch clockwise to “CLOSED.” 3. Secure sprayer tip down in holster. 4. Failure to adjust nozzle completely to CLOSE position and properly secure sprayer in holster may result in leakage and damage to property or injury to people or animals. 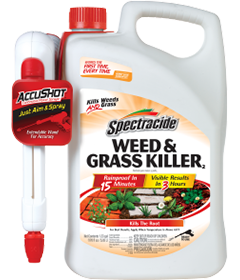 Keep reusable AccuShot Sprayer for use with Spectracide® Weed & Grass Killer3. To replace batteries: 1. Use screwdriver to open battery compartment. 2. Remove used batteries and insert four new AA batteries in correct positions as marked per diagram inside of battery compartment. Never insert the positive end where the negative end belongs and vice versa. Always use a complete set of new batteries of the same type when replacing batteries. Never mix alkaline, carbon-zinc or rechargeable batteries. 3. Securely close battery compartment door. 4. Always follow manufacturer’s recommendations for use and disposal of batteries. Before each use, inspect sprayer carefully making sure hose is flexible and not kinked, worn or cracked, and that all connections are tight. When storing sprayer for prolonged periods, remove batteries. For best results, apply in spring or fall, when daytime temperatures are at least 60˚F. Under dry conditions, water lawn every other day for a week before applying this product. Spectracide® Weed & Grass Killer2 is pre-mixed and ready to use and is formulated for “spot” treatment of weeds and grasses. Use it on driveways and walkways, or around fences, trees, flower beds, shrubs and other areas in your yard. Pesticide Storage: Turn the nozzle to “CLOSE” position. To prevent leakage, place sprayer in holster. Store this product only in its original container in a secure storage area away from sources of heat or open flame and in an area inaccessible to children and pets. Keep from freezing. Pesticide Disposal: Do not discard the AccuShot® Sprayer. 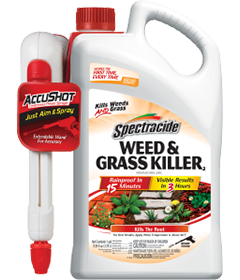 Keep the AccuShot Sprayer for use on Spectracide® Weed & Grass Killer3. Nonrefillable container. Do not reuse or refill this container unless the directions for use allow a different (concentrated) product to be diluted in the container. If empty: Place in trash or offer for recycling if available. If partly filled: Call your local solid waste agency for disposal instructions. Never place unused product down any indoor or outdoor drain. CAUTION. Causes moderate eye irritation. Avoid contact with eyes or clothing. Users should wash hands before eating, drinking, chewing gum, using tobacco or using the toilet. Users should remove clothing immediately if pesticide gets inside. Then wash thoroughly and put on clean clothing. Users should remove clothing and personal protective equipment immediately after handling this product. Wash the outside of gloves before removing. As soon as possible, wash thoroughly and change into clean clothing.